TintCenter Window Tinting > Window Film Blog > Health Benefits > Home on the Range – Is Wind Power Within Our Reach? Home on the Range – Is Wind Power Within Our Reach? The cowboy rides up to the crest of a hill overlooking some of the vast acreage his ranch encompasses. He wants to take a good look at his assets. It is not cows he is looking at, but rather miles of wind turbines. Travel west of San Antonio, Texas and as you near the far west border with New Mexico, you will see miles of these white giants silhouetted against deep blue skies. When cowboys see the future and grasp it with the same enthusiasm as roping a cow, you know there must be something to it. Large scale wind power farms have been around a long time now. Head out to some narrow canyons like those around Tehachapi, California where the Venturi effect serves to generate enough constant wind speed to keep these giants running nearly 24 hours a day. Many of these have been operating thirty years or more. Increasingly, large land owners are realizing that raising animals for months on end for a couple of big sales each year is not the best way to realize profit, especially if they notice that breeze of at least 9 miles per hour blowing the dust everywhere. Commercial wind power operations are here to stay, but what about residential use? Isn’t it about time this technology helped the little guy with his energy costs? There are companies that have moved into this wind market in recent years but it is worth remembering that these units are still in their infancy. There are challenges that have yet to be conquered when it comes to creating what is essentially a mini-version of those commercial turbines. First, there is a reason these structures are at least 100 feet (30 meters) or more above the ground. At that height, winds are faster and less turbulent. 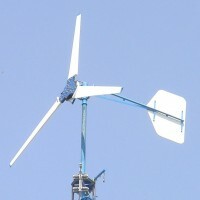 Wind turbines operate best when wind speeds are smooth and steady. Most homeowners don’t want a tall pole in their yard anyway. That brings us to the next hurdle. Where are you going to mount a wind turbine? Two issues face the homeowner. Tall poles may be unsightly but add to that the sound of a nearly continuous turning blade and the neighbors might be up in arms. While the sound from small turbines is not particularly loud, it is a constant background noise. Some companies are opting to put these small units on rooftops but beware-standard residential roof construction is not meant to hold much weight. The addition of a vibrating motor with whirling blades could be a prime setting for catastrophe. Also, length matters when it comes to rotor blade size. Longer blades produce substantially more energy but again these add weight to the design. One company has a three unit system, each comprised of shorter blades. These units can be mounted to a roof. It is the operations of these three units in concert which produces the maximum energy capture. This is not to say that you can’t find a good product out there now on the market for home use but being an informed consumer is advised when it comes to generating electrical power for your home. Some form of wind energy has been harnessed by individuals for home use for centuries. The technology is there; it just needs some fine tuning to make wind power generated electricity within the reach of us all.